Starting today, Acer will toss in a wheeled carrying case and Tom Clancy's The Division on DVD (both while supplies last) with the purchase of a qualifying Predator desktop. A carrying case for a desktop may seem like an odd thing to bundle, but since its unveiling three months ago, Acer's talked up the Predator's compact design. 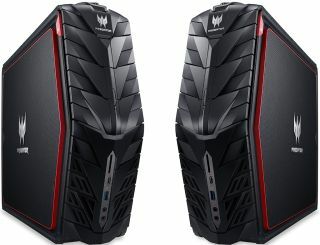 "The Predator G1 (G1-710) gaming desktop squeezes awe-inspiring power into a compact 16-liter body and is designed for gaming at home or on-the-go. This highly transportable gaming beast easily fits under an arm or in an optional carrying case, making it the ultimate war machine for serious gamers and LAN parties.," Acer said at the time of its unveiling three in April. In addition to a GeForce GTX 1080 graphics card, the limited edition Predator wields an Intel Core i7-6700 processor, 32GB of DDR4-2133 memory, 512GB SSD and 2TB HDD (7,200 RPM), 8x DVD burner, 802.11ac Wi-Fi, Bluetooth 4.1, GbE LAN, five USB 3.0 ports, a single USB 3.1 Type-C port (Gen 2), and Windows 10. That's not a bad collection of hardware, though adopting a Predator doesn't come cheap, at least not this one—the asking price is $2,300. It comes with a Predator Flare mechanical gaming keyboard and mouse, but not a monitor, speakers, or headphones.